The week before Christmas a stack of books about Central Asia arrived. I plan to laze about reading them during the holiday season. What a treat! Firstly, the latest issue of Steppe Magazine is here. It is devoted to Kazakhstan: profiles of artists, musicians, and a restorer of ancient artefacts. The feature stories take in wild fruit forests, tulips, tus kiiz (beautiful embroidered yurt hangings), Kazakh film, and a journey across the steppe by train. Steppe Magazine is truly worth subscribing to: an online subscription is just US$20 and you get access to all the back issues. My preference is a hard copy subscription. The photography and articles are superb; I dip into my issues all the time. It's a perfect gift, too. Next is the catalogue from an exhibition I saw in 2007 at the Textile Museum in Washington: Architectural Textiles: Tent Bands of Central Asia by Richard Isaacson. Isaacson is a retired physicist, who has simultaneously pursued a strong interest in art and oriental carpets. As he writes, "the trellis tent, or yurt, is a brilliant invention. It has made nomadic life possible across Central Asia for at least one and a half millennia. An important component of its construction is a woven tent band which girdles the lower part of the wooden roof struts. This critical engineering element provides the tension necessary to brace the roof dome against outward collapse under the load of heavy felts and the force of strong steppe winds". 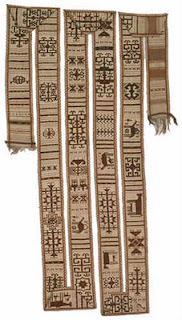 Beyond serving a utilitarian function, tent bands are often elaborately decorated.These are not little narrow bands: these are 30 - 35 cms wide, exquisitely woven and highly decorated bands. Each band is many metres long, as it has to go around the the whole yurt; the ends of the bands are braided. Here is a 2-minute video clip of the exhibition in which Mr. Isaacson and the curator discuss the exhibtion. On an Uzbek Journeys tour you spend one night in a yurt at Ayaz Qala, where you can admire the tent bands. 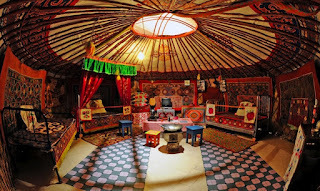 The next day you visit the Savitsky Museum in Nukus, which not only includes a beautifully decorated yurt but also has a fine collection of tent bands. Then there is the splendid book Kyrgyzstan by Klavdiya Ivanove Antipina, which documents Kyrgyz costumes over the last 150 years. Antipina was an ethnographer, who, during her studies in Moscow, was branded an 'enemy of the people' and exiled with her son to Kyrgyz SSR in 1934. She was finally able to obtain a post as a travelling teaching adviser that took her all over the country, especially the south. It was only after Stalin's death in 1953 that she could officially complete her studies, graduating with a PhD in 1962. She journeyed by horseback documenting the craft, costumes and customs of Kyrgyz nomads as they were being forced into sedentism. Antipina devoted her life to this research. Tragically, Antipina's text disappeared before a definitive book was published. Three years before her death in 1996 (aged 92), she was interviewed about the lost text and all aspects of traditional Kyrgyz costume. In 2006 this book, produced from the transcripts of those interviews, and now a seminal source of information on Kyrgyz costume and embellishment, was published in Italy. The illustrations, based on Antipina's photographs from her travels, are by Temirbek Musakeev, with whom Antipina collaborated. 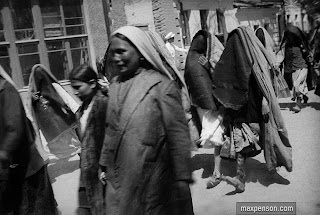 My final splurge is a German/English volume of Max Penson's work 'Usbekistan: Dokumentarfotografie 1925-1945'. I have written elsewhere about Penson's photography and this is the only English publication I know of some of his works. Swiss couple Oliver and Susanne Stahel purchased this portfolio of prints taken between 1925-1945. The images document the massive transformations taking place at that time. As Russian film pioneer Sergei Einstein said of him "Penson's unparalleled photo archives contain material that enables us to trace a period in the republic's history, year by year and page by page". This book is hard to come by and I am thrilled to have a copy. There are more titles in my pile, but these are the first I'll be reading. All the details about these books are noted in the book list section of this website.